It’s a perfect morning for charts, so let’s make sure to consume our daily nerd vitamins. 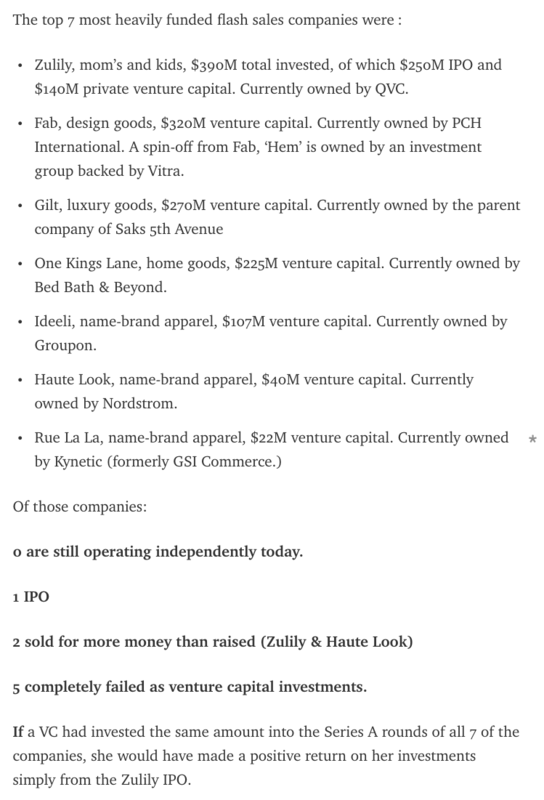 Today we are taking a quick look at the venture capital market for United States-based startups, and at a set of sequential failures that help explain how fads boom and bust inside the startup scene. 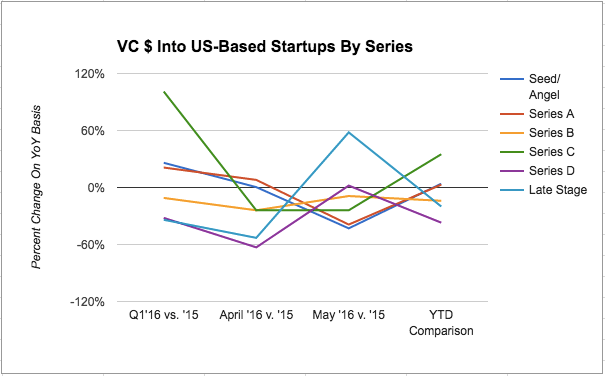 Yesterday Mattermark published a detailed report digging into the current state of venture capital activity relating to United States-based startups. The results were mixed. After a strong first quarter in many ways, total deal volume began to slip in the second quarter. And in both the first quarter, and each of the first two months of the second, aggregate dollars raised by domestic startups from venture capitalists fell. There is still lots of money to be had, but the climate appears to be more cautious now than it has been these past few years. To simplify the lengthy post, I graphed two important sets of its data to help bring a dose of clarity to the situation. I isolated the aggregate funding chart from the per-Series image to help pull the signal from the noise. The most important data points in either chart are the first and last in the second graph. 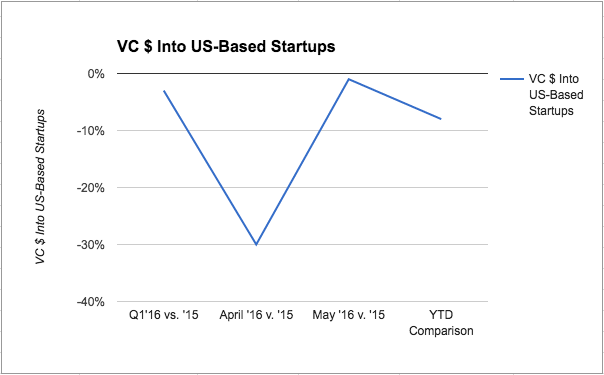 Total venture dollars invested into United States-backed companies were flat to slightly down in the first quarter. And, taking into account what we know about the second quarter so far, things look modestly worse. Ask yourself if that doesn’t gut check. Yes, public market corrections and all but no IPOs scared people, but not too much. After all, the Nasdaq is still near trading in the range of all-time highs, venture funds have fresh cash, and hell, if Twilio’s offering goes well we could see more IPOs later this year. There is more caution, but no whole-cloth creation of new market norms. At least not so far. If that is enough of a correction I leave to you. You must recall Jason Goldberg of Fab fame, a company that went through hundreds of millions of venture capital before having what was left of its assets sold for pocket change. It became a cautionary tale of big goals, quick growth, and staggering spend. At its peak, Fab, a company in the flash-sale space, was worth $1 billion according to TechCrunch. The final listed point is interesting, but it’s also worth noting that the final sale price of Zulily was below its IPO per-share valuation. And that is after a 50 percent premium was attached to the company to ensure a smooth deal. Public at $22, it saw intraday lows as depressed as $9.09, according to a Forbes report. Of the seven total firms that raised the most capital in their space, 71 percent were write-offs, two managed to sell for more than their aggregate raise — which does not imply an up-exit on a valuation basis — and one managed an IPO that eventually was subsumed for a discount to its offer price. Heck, One Kings Lane alone was worth over $900 million just a few years ago. That’s a limited set of success for the amount of capital invested and time spent building and exiting these companies. However, it’s not the first time that we have seen a set of startups with similar business bents come to the fore, raise a host of cash, drive media narratives with their success and then hit choppy waters nearly en masse. We’re seeing that contraction right now in subscription boxes. We’ve seen a large percentage of the air leak out of the cloud storage market. For a hot minute, every venture capitalist needed exposure to bitcoin. Now it’s all about the blockchain, but the phenomena is the same. Up next is likely chatbots, I suppose. This goes all the way back to when pen computing was new, through the eyeball craze of the first tech boom, and on and on and on. But what I want to remind myself, and your good self of is that when a pile of capital both in dollar and human terms moves in a single direction, most players in that space are going to zero. Lost in our constant reverence of success are the companies that fall by the wayside. Send in your favorite non-alcoholic La Croix mocktail recipes, and you will rewarded with good luck the rest of the day.